• Snip, snip: Member for McMillan Russell Broadent cuts the ribbon, with PCAC resident Audrey Truscott and PCAC CEO Rhett McLennan. 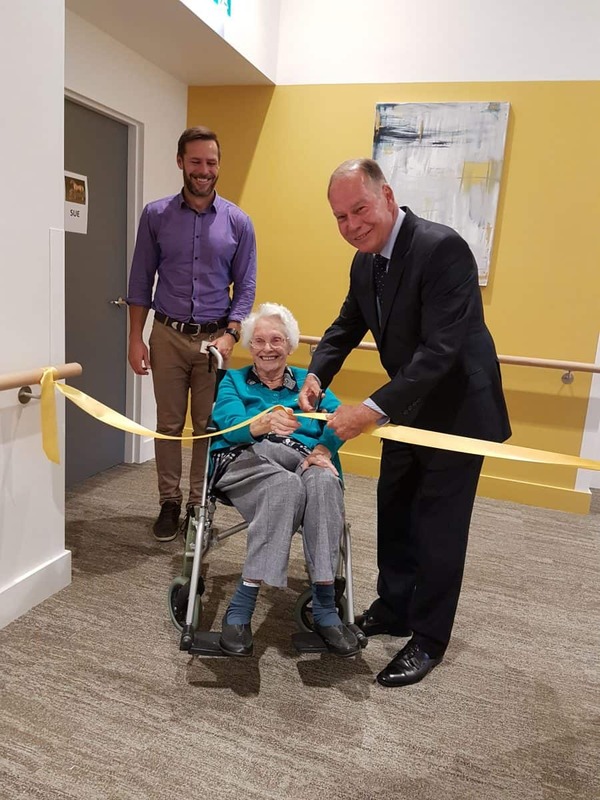 MEMBER for McMillan Russell Broadbent cut the ribbon at the official opening of Prom Country Aged Care’s extension last Friday (November 23). The extra seven rooms, spacious outdoor space and new office facilities have been praised by residents and employees alike. Mr Broadbent was just as effusive, telling his audience that the building – constructed in partnerships with architects Clarke Hopkins Clarke, project managers Connect Project Managers, builders Considine and Johnston and a dedicated PCAC building sub-committee – was “a piece of artwork everyone can enjoy”. “Quite often lay people like me see these creations as just a building. When you know that there’s been a building sub committee and it’s been through the whole process with the builders, it goes from being a building to a piece of artwork everyone can enjoy,” he said. “You stand here with the visage I have at the moment, and you see the colours and the furniture and the floor and the carpet and all the work they’ve done. They’ve created an atmosphere through the fire and the grey on the wall. Mr Broadbent said he had spoken to residents who said the PCAC staff were “absolutely magnificent and they thank them every day”. The statement drew applause. “I think the greatest honour I can give to you and you to me, is the honour of being here today. I appreciate that,” he said. “We may provide the best buildings in the world for this generation of Australians, but we also provide the most magnificent staff in the world to look after our older people. I’m really thankful for that.